A couple of months ago, accompanied by my younger son, I attended the All Party Parliamentary Group on Autism in Westminster, as a witness. We were reassured that the evidence that I and all the other witnesses gave, as well as the other information the APPGA had gathered, would not just end up forgotten in a report but would be the basis for action. Son2 looking engrossed, with Catriona Moore in bg! Today, that report, Autism and education in England 2017, with an introduction by Cheryl Gillan MP, has been published. The SEND Minister, Robert Goodwill, who must be wondering what kind of poisoned chalice he's inherited, has already responded saying it would be considered carefully, alongside the recent Lenehan review (which came out while I was away, so we didn't cover it ourselves but you can find it here). 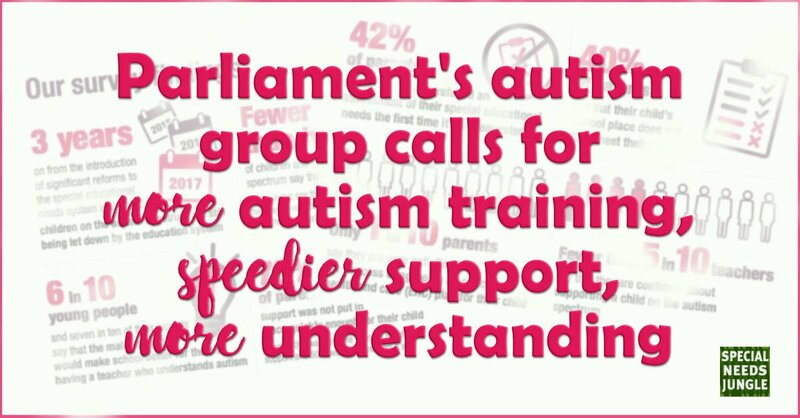 The All-Party Parliamentary Group on Autism consults regularly with autistic people and family members on their priorities for change with education consistently as an area where further attention is needed. Its members are also advised by an advisory group made up of autistic adults, parents, professionals, and charities. The inquiry heard from a range of expert witnesses, including parents, young people, local authority commissioners, education providers, professionals, and advocates. Additionally, an online survey of parents, carers, young people and teachers was carried out with the National Autistic Society. Fewer than half of the young people on the autism spectrum who responded to our inquiry’s survey say they are happy at school. Seven in ten told us their peers do not understand them, and half said their teachers do not know how to support them. For many children and young people on the autism spectrum, school is a difficult and isolating experience. It's a very thorough, well-written report covering the range of problems parents and children experience including the fact that children with autism are three times more likely to be excluded from school than a child without SEND. It also touches on accountability and the fact, raised by one parent, that those parents less knowledgeable about the system often do not know when they've had a bad experience - in other words, they just take what they've been handed, unaware that they were supposed to be involved in an Education, Health and Care Plan's (EHCP) development, that new assessments should be carried out for a transfer from a statement and that the final plan may be so vague that their child has no effective provision from it. and guidance for local authorities on commissioning the full range of educational provision and support. Autism understanding should be embedded in the education system, with autism training for all teachers, including head teachers, and ongoing funding for the Autism Education Trust. Local authorities should collect data on the number of children and young people in their area who are on the autism spectrum, and on the profile of their needs, and use this data to plan and commission the school places and other services they will need. There should be a presumption by local authorities that a child with an autism diagnosis may need an education, health and care needs assessment, and this should be carried out when it is requested. A clear accountability framework should be put in place that requires local authorities and maintained schools, academies and free schools to be clear and transparent about how they are adhering to the Children and Families Act 2014 and the SEND Code of Practice. The Department for Education should review the funding that is available to local authorities to support implementation of the Children and Families Act 2014, and allocate additional funding if it is needed to help complete the transition to the new SEND system. Ofsted should be required to monitor implementation of the Children and Families Act 2014 more closely in local areas and should report on it to Parliament annually. The local area SEND inspection programme should be made permanent so that every local area is inspected on a regular basis. Local authority staff and school staff should receive training in the requirements of the Children and Families Act 2014 and the SEND Code of Practice. The report highlights evidence they've heard from both parents and teachers, that poor understanding of autism means that children are often punished by schools for what is seen as ‘poor behaviour’ when what is often going on is an expression of how anxious a child is in the school environment. It says schools do not always recognise that the behaviour they see may be an ASD child's attempt to communicate their anxiety, and indicate that their needs are not being met. It acknowledges that the school environment may be very difficult for children on the autism spectrum and reasonable adjustments should be made to help them cope, and a school that doesn't do this – as mandated in the Equality Act 2010 – but focuses only on the ‘behaviour’, is setting a child up to fail. help pupils manage relationships with their classmates. 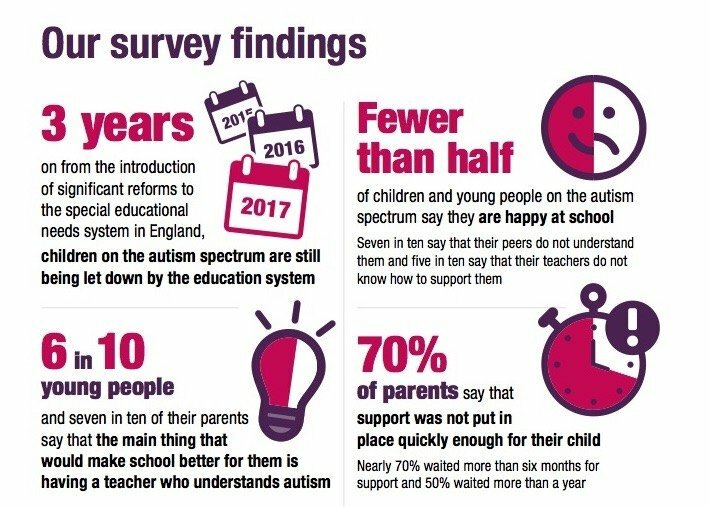 The report recognised that autism is to be made a core part of Initial Teacher Training (ITT) from September 2018, but said just one in four teachers who responded to the survey said they'd had any autism training while completing their teaching qualification. While nearly eight in ten said they'd had some autism training since qualifying, less than half said they felt confident about supporting a child with ASD. Interestingly, confidence levels were higher if the child had an EHCP. It's not surprising therefore, that more parents are seeking statutory assessments to ensure their child is well-supported. Indeed, a key theme that came up time and again in our inquiry was that all education staff need to understand autism. During the course of this inquiry, we heard that many children on the autism spectrum are being failed in various ways by the education system. This is demonstrated by the number of requests for statutory assessments that are being refused by local authorities, the long waits for support to be put in place, the difficulty in securing reasonable adjustments in schools, and the high level of exclusions from school of children on the autism spectrum. Action is needed in the short term to make sure that the Children and Families Act 2014 and the SEND Code of Practice are fully implemented, and that there is accountability for decisions that are made about the education and support provided to children on the autism spectrum. In the longer term, we urge the Government to develop a national autism and education strategy that addresses the need for better understanding of autism by education providers and commissioners, and more effective commissioning of services and support for children on the autism spectrum. Other recommendations include that autism, and SEND more widely, should be fully built into professional development for all head teachers, that there are clear procedures for reporting unlawful exclusions from school, and that local authorities should develop ‘hubs’, or centres of excellence (which could be special schools or mainstream schools), where educators can develop and share their expertise. Only one in ten parents who responded to the survey said they were ‘very satisfied’ with the process of agreeing an education, health and care plan for their child. 60% said they were dissatisfied. Just over half the parents who responded said they were fully involved in discussions about their child’s EHC plan but over 40% of parents said their child was not involved in this process at all. This is despite parental co-production being a clear requirement in the legislation. A lack of resources is insufficient reason to fail to meet all a child’s needs. The Government needs to ensure that local authorities have the funding required to meet those needs. However, it’s also important that these issues are discussed openly with parents. Including parents in early conversations about how to make use of available resources and having proper discussions about their child’s education and support needs could increase the chances of finding a solution that works for the child and pleases everyone. Keeping families at arm’s length, and requiring them to potentially initiate legal appeal proceedings before any compromise is discussed, sets the two ‘sides’ up as opponents when they should be working together. The APPGA report acknowledged that Ofsted and the Care Quality Commission have an important role to play in the local area SEND inspection process and called for them to be made a permanent fixture, regularly repeated. I'm pleased that the report does capture the 'headlines' of the problems parents face: the lack of accountability in the system, the failures of commissioning for the needs of autistic children, the need for local authorities to obey the law and for teachers to be properly and thoroughly trained in recognising and teaching children with autism. It only just references the difficulties with funding however. The cuts in schools funding generally, coupled with the lack of funding for SEND has become a perfect storm for disabled children. 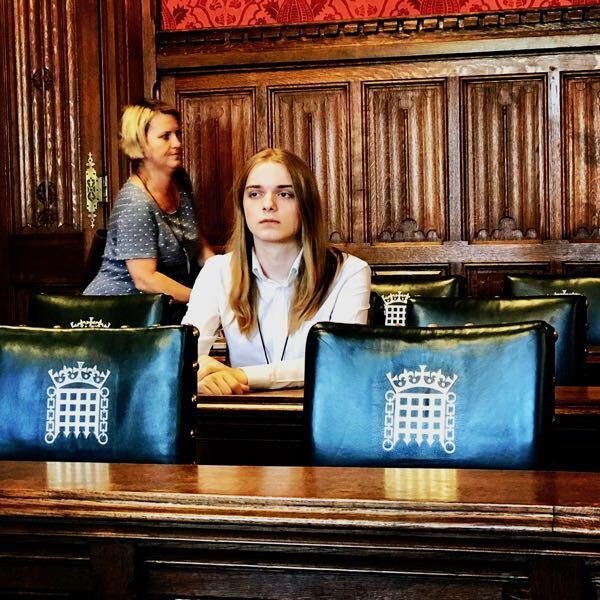 Schools with funding crises cut back on support assistants, and may even 'redistribute' delegated SEN funding for core needs, and this makes them less able to support children with autism and other special needs. While children without additional needs can probably manage without support staff in mainstream, our children definitely can't and this is why more parents will turn to specialist schools and therefore need EHCPs for their children to access these settings. As I am quoted as saying in the report: cuts and inclusion do not mix. I know that the government cite how much money they've injected, but they're the ones who came up with the vision for an integrated and inclusive SEND system. It doesn't matter how much they've already put in; if it isn't enough, they must do more. Perhaps they should have costed it out for the long term before they put the white paper on the table to start off with. People such as Jayne (now Judge) McConnell, then of IPSEA, were warning all along of the mire the DfE were wading into without sufficiently extensive consideration, but no one in Sanctuary Buildings wanted to listen. I hope the new minister do more than look carefully at this report but act on it as well. Mr Goodwill, will you now please open your eyes (and your wallet) and see that you can't leave a job half done and leave a generation (and potentially more) of disabled children without the future they deserve? Thank you for this. It was a very interesting read. I will say though that the most dangerous word used in legislation from central government though is “should”. This needs to be taken out as it feels like it is an open hand gestures of well they should be doing this or that and its not our fault that they arn’t. Feels like a pass the buck situation that reinforces the no accountability nature of SEN support. I think it need to go beyond autism training, there must also be training for the areas effected when you are autistic, speech language and communication, sensory processing disorder, behaviour as a communication and anxiety. I know of a teacher starting out in the professions that noted that one child only remembered the last thing asked,I know that is potentially an auditory memory issue, I know this as I did a 20 hour course in relation to children that are verbal and autistic. It was at practitioner level and I am merely a parent and its assisted my understanding and opened up possibilities for our children no end. If you give the teachers the tools, they will use it. If they are taught about autism and nothing else, they will not be able to be effective. One a teacher is in the field it is very difficult for them to get in any additional training, even if it is free, due to the fact so many of them work so many extra hours as it is, and even when they are not at work, they are thinking about and planning in their mind things to do with work. So we need to create a platform that is accessible and flexible for them to be able to access training and CPD in these areas. However, school is not the only area of educational need, so is home and the environment and life outside of school, this area of support needs addressing too. To develop people mindsets to create inclusion then we need to be educating not just hte children but also those that support them. what needs to be understood is that investment in this area has a long long term impact. All that I learn and the skills I acquire, will be passed within my family and some of my community. All that teachers learn and the skills they acquire will also have the same impact.